Invite your followers, comrades and friends! Come in groups! We have a group rate of $20 each person! 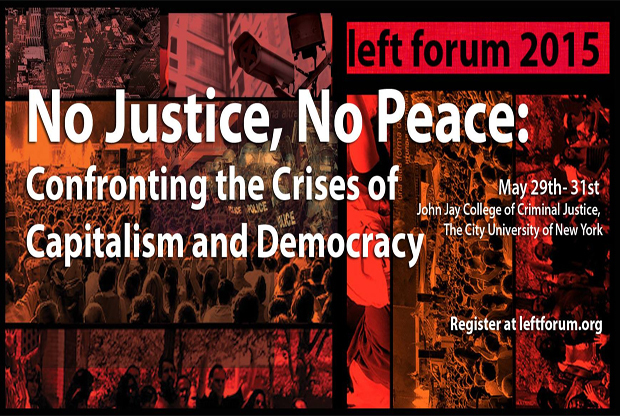 The 2015 Left Forum will take place in a period of excitement and challenge. In Greece and Spain the Left has either taken power or is on the verge of it. At home, police violence is now being contested by a popular upsurge of protest and resistance. And facing a solid reactionary front, president Obama has finally shown signs that the administration, however hesitantly, is responding to deep mass disaffection. From the recent Syriza victory in the Greek elections and movements against austerity throughout Europe to the spread of horizontal-democratic politics around the world, and from the nationwide activism arising out of Ferguson and the Black Lives Matter movements, to the growing momentum to end the Cuban embargo, recent events and left politics in the current year are shaping up to be pivotal. The conditions of the rise of these transformative politics are daunting: the twin economic and ecological crises persist with predictable social consequences: deepening inequalities of wealth and income, erosion of civil liberties, and dangerous scapegoating by those not facing the systemic nature of our problems. The promises of the political and corporate elite for democratic rights and freedom ring evermore hollow in the court of public opinion. They are like warped nightmares of a reality in which most democracies are strangling the promise of “we the people” with democratic hierarchies that privilege capitalist ideologies in every public and private institution. Simultaneously, the global economic and political system is inflaming violent conflicts, while pushing populations of many countries into permanent wars of conquest. Within national borders, capitalism now relies increasingly on military and police forces to intervene brutally to maintain the system by subordinating ever more groups. And this transpires while the surveillance state apparatus pours-over and tears into more and more of everyone’s public and private lives. In the past decade we have experienced a series of climate-related catastrophes: extreme weather that, among other events, has destroyed crops and precipitated unprecedented hurricanes that have devastated many cities and towns throughout the globe. Meanwhile, the powers that be sanction the depletion of the earth’s non-renewable resources while basically ignoring warnings from environmentalists that the clock is ticking towards a planetary point of no return. Clearly, we need radical solutions that entail a major re-evaluation of capitalism’s viability. More than ever, we need to assemble and mobilize the fast-growing ranks of those able and willing to face these problems. As the systems that supposedly were built to sustain society fail so many so badly, activists for democracy, sustainability, equality, and the abolition of oppression and exploitation increasingly grasp their shared demand for basic social justice. Yet these are times when the usual liberal democratic remedies have lost their relevance. Pressing questions loom for justice seeking social forces: What is to be done today when a reform brings us one step forward, while leaving other important struggles worse off in the process? What type of movements will it take to overcome such challenges? What type of institutions, systems and societal conditions are possible when transformed conditions of justice no longer take the forms of, “the aggrieved speaking to the grievance alleviators”? How do these issues raise the question of confronting and ending the crises of capitalism and democracy? Please come analyze, debate, build, ally, and strategize at Left Forum, 2015.